The Great Dane is known as a giant dog breed and is one of the largest dog breeds. This is a regal, intelligent and loyal dog with a warm temperament. Often called gentle giants, Great Danes are loved for their joyful spirits and loving companionship. Great Danes bond closely with their owners and make wonderful family pets. A well-trained dog will thrive in most households. Your home does not need to be extra large in order to accommodate the dog's huge size, but you do need extra space (especially due to that long tail). Unfortunately, like other giant dog breeds, the lifespan of this breed tends to be shorter than the average dog. However, lovers of this breed will tell you any amount of time with a Great Dane is worthwhile. 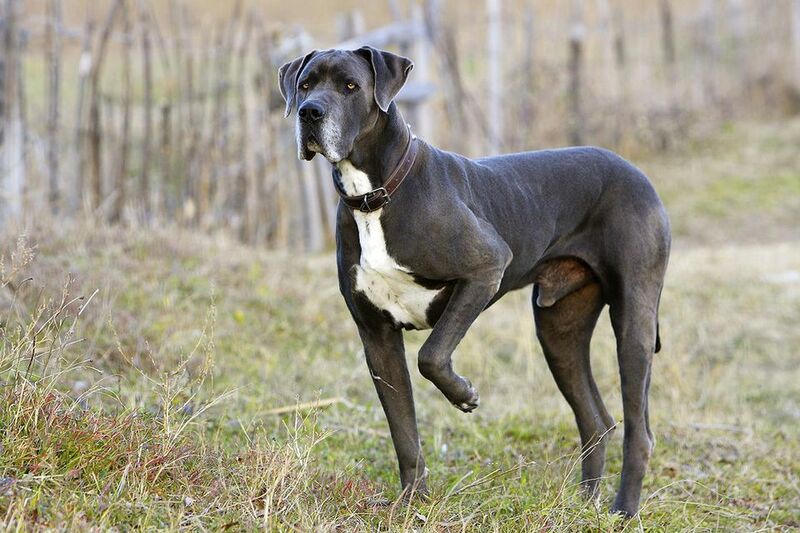 Great Danes originated in Germany although some believe the breed has ancient origins. They most likely emerged from the English Mastiff and Irish wolfhound. Despite "Dane" in its name, the breed was developed in Germany as a boar hunter. The powerful boar required a similarly powerful dog for holding the prey until the hunter arrived. Over time, the breed was no longer considered a hunting dog but became more known as a watchdog and companion. German breeders aimed to make them much less aggressive and this led to their gentle dispositions most common today. Great Danes appeared in the United States in the late 1800s and have become gradually more popular over time. The breed was officially recognized by the American Kennel Club (AKC) in 1887. Great Danes top the list of the Guinness World Records for the world's tallest dog. A recent record holder is Zeus at 44 inches. In popular culture, the cartoon Scooby-Doo and comic-strip character Marmaduke are both Danes. The breed has also been cast as the titular character in the film versions of Sir Arthur Conan Doyle's The Hound of the Baskervilles. Great Danes have a short, thick coat that typically needs nothing more than routine grooming with weekly brushing. They shed especially heavy during the spring and fall. Great Danes need to bathe routinely, usually once or twice a month. Danes with natural (floppy) ears should have routine ear checks and cleanings. While some people prefer to surgically crop the ears, this practice is becoming less common and is actually banned in some countries. You should trim your dog's nails every couple of weeks to keep them healthy and from splitting or tearing. In order to maintain good oral hygiene, brush your dog's teeth at least a few times per week. This will help prevent gum disease. Proper training and socialization are absolutely essential for the Great Dane. The giant size of this breed makes it very difficult to manage if not properly trained. These dogs do not realize their large size, so careful attention should be placed upon prevention of jumping, leaning, and leash pulling. Great Danes are playful and energetic when young. To keep their growing bones and joints healthy, don't allow them jump and don't take them running until they are at least 18-months old. As they age, most of these dogs have moderate energy levels. Routine exercise, such as daily walks, can help keep your dog fit and healthy. They can play in a fenced yard—they aren't prone to fence jumping. They are easy to housetrain and prefer to be indoors with the family rather than alone in the yard. Crate training with a Dane-sized crate is recommended by many dog experts. Great Danes are usually gentle and loving with children, although as a large dog they can knock over a child simply by bumping into one. Younger children will not be able to control such a large dog on a leash. Danes also do well in multi-pet households, especially if raised with the other pets. You will need to pay attention to the right diet for Dane puppies as they need large breed puppy food to ensure they don't grow too fast. Discuss the feeding schedule, type of food, and amount with your breeder and veterinarian. Puppies should be fed three meals per day. Adult Danes will require a lot of food—up to 10 cups per day. It is important that they are fed two or more times a day rather given one larger meal or allowed to feed freely. This breed is prone to gastric dilatation-volvulus, which is means that they will experience bloating when they eat too much or too fast. This can lead to stomach torsion, cutting off the blood supply and trapping gas, which is a veterinary emergency. You can also inquire with your local shelter to see if there are any Great Dane rescues in your area. If you think the Great Dane is the right dog breed for you, be sure to do plenty of research before adopting one. Talk to other Great Dane owners, reputable breeders, and rescue groups to learn more. Unfortunately, there are many dogs who need a new home as their original owners found they were not a good match. Explore more of our great variety of dog breed profiles.